The Coleco Section’s 31st season was marked by the first appearance of a regular Rosemont Hockey League player, Eric Belzile, who placed first in qualifying in front of Daphne and earned the title of champion in the final against Jimmy in a 2 of 3 series hotly contested. Other highlights include: Jean-Alexandre defeated Eric Imbeau in the quarter-finals (3-2), but was eliminated in the semifinal by Eric Belzile and finally Jimmy won the other semifinal series against Daphne in two games. 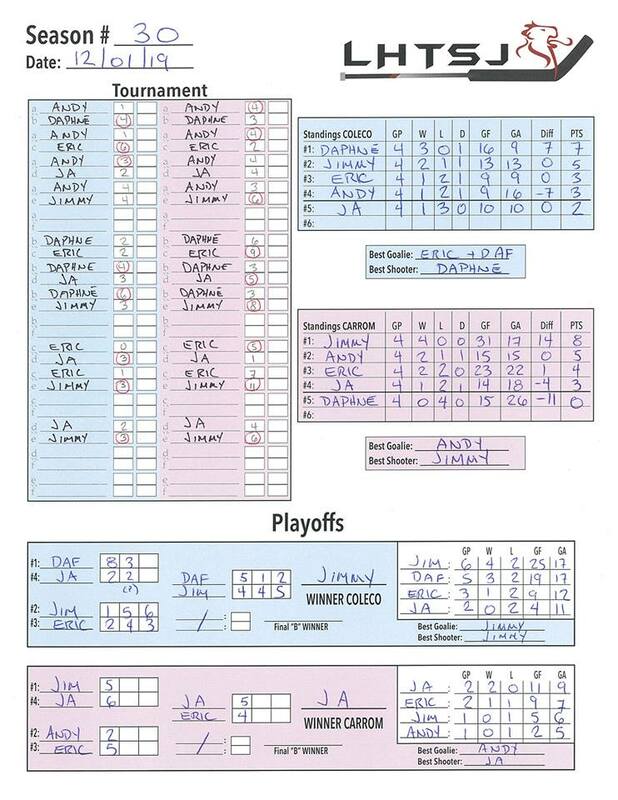 Results of the 31st season at the Dome Hockey: For the first time, Daphne climbed to first place in front of Jimmy and also participated in the final of the Labelle Cup. Good improvement. Proof that playing Coleco helps perfect his game on all table hockey models. Note the fine defensive game of Andy and also the great offense of Eric and Jean-Alexandre. 30th season of the LHTSJ: at the dome, Jean-Alexandre won the title of Champion against Eric in the final in which he made a rise of 3 points in extremis to finally win 5-4. In the semifinals, he eliminated first place Jimmy, although he scored 5 consecutive goals in the third period, but it was not enough to stop Jean-Alexandre who won 6-5; at Coleco, Daphne was again in the lead for the second time and met Jimmy once again in the final. Despite the advent of a third game, she could not defeat his opponent. Note also the good performance of Eric in the semifinal which also led Jimmy until the third match.